Week One of the New Ideas Festival opened tonight at Alumnae Theatre. Toronto has a lot of theatre festivals and the New Ideas Festival is one of my favourites. I look forward to it every year. It runs for three weeks. Each week there are 4 new productions and a staged reading. That’s 12 new productions and 3 staged reading in three weeks. 15 world premieres. Until tonight it hadn’t really occurred to me what an undertaking this is. This year there were 122 scripts submitted. Imagine having to winnow that down to 15. And then producing them. All of the pieces are still in development and the playwrights want audience feedback. There’s a comment sheet inside the program for you to use to tell them what you thought of the work and to make suggestions. The format is the same each week, two plays, and intermission, then two more plays. Some are quite short, tonight one was 12 minutes, another was 15, another 45 and the last one was 20 minutes. Sometimes a piece will be one act of a play. Act 1 of Frances and Marybeth, now at Factory Studio Theatre, was part of the New Ideas Festival last year. Tonight they were all stand-alone pieces although it was easy to see how they could be developed into longer full-length works. To some extent a festival like this is always a crapshoot. Not in terms of the quality of the work but in terms of the types of plays that you’re going to see. That can be a good thing. Personally I’m not likely choose to see a drama about a schizophrenic teenager. Which means that I would miss Let My Mind Run Dry by Cassidy Sadler. The play is presented from an unusual, but very effective, perspective. My only suggestion was based on my bias against actors doing accents. It’s tough and if the accent isn’t done really well it can detract from the piece and get in the way. My suggestion is to change the setting so that accents aren’t required. One of the amazing things about Cassidy is that she is a Grade 12 student. Wow! Definitely someone to watch for. After The Man with a Butterfly Hat? by Donna Langevin my friend Elaine turned to me and said “That was sweet.” It was. It’s easy to see it as part of a longer work that follows the development of the relationship between the widower and the security guard. We both loved Our Eliza by Megan Coles. Terrific characters. Great dialogue. It’s told in a series of flashbacks which can be difficult to pull off. I did get a bit confused in the first few minutes trying to figure out where we were in the story. Maybe add something at the beginning to frame the piece. Lover’s Flight by Joel Fishbane is such a clever idea. And very funny. It would make an excellent movie. Elaine and I both thoroughly enjoyed the evening. There was terrific writing and amazing acting talent. Definitely worth seeing. And there are two more weeks to come. – Performances are Wednesday through Saturday at 8 pm, Saturday and Sunday matinees at 2.30 pm, staged reading Saturday at noon. 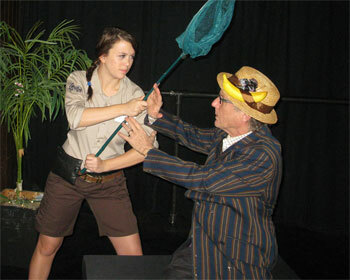 Photo by Anne MacMillan of Cheyenne Scott (Guard) and Donald Baker (Man) in The Man with a Butterfly Hat by Donna Langevin.